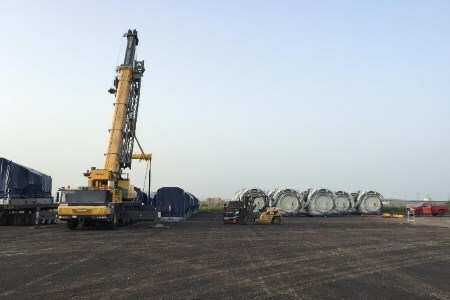 Port of Corpus Christi’s new breakbulk cargo laydown yard, the Rincon West Yard, received its first shipment of wind turbine components on 14 July. Top wind turbine manufacturer, Vestas, is scheduled to import wind turbine nacelles, hubs, drive trains and blades for the Blue Cloud Wind Farm, located in Texas Panhandle counties Baily/Lamb. The Rincon West Yard will serve as the first point of rest for the imported breakbulk cargo prior to components being shipped via truck to the jobsite. Developed by Tri-Global Energy, the 148 MW Blue Cloud wind farm is comprised of 19 000 leased acres of privately owned farm land. Recently available at the Port of Corpus Christi, the Rincon West Yard is a 25 acre laydown yard in close proximity to Cargo Dock 9, located on the north side of the ship channel. Developed for Heavy Haul and Breakbulk Cargo with a 20 in. stabilised limestone base, the Rincon West Yard includes potential for onsite railroal tracks. Adjacent highway systems and barge docks represent added logistical benefits for the new yard.